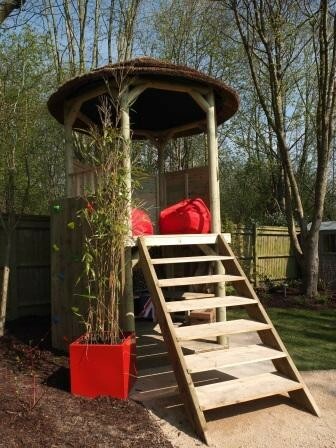 We had this bespoke treehouse made to suit the needs of George, with a climbing wall, secret trapdoor and hidden den underneath. We approached a company that makes ground level, thatched roof gazebos and asked then if they could make one on stilts…which they did! We also designed it so that when George grows up, it can be a place for him and his mum, Trish, to chill out in. Being on stilts, it also has the benefit of overlooking the whole garden, giving a totally different perspective than sitting at ground level. There is also enough room in the main treehouse area for a table and chairs, so it also doubles as a secluded dining area…although I’m sure George won’t allow that for quite a few years! The treehouse is made from carefully selected wood from sustainable forests and we decided on a thatched roof because it fitted in with the woodland behind the garden. The great benefit of the roof is that it will keep out the water if it rains. It also has solid infill panels, which also help to keep out the weather which makes it perfect for George in all but the worst weather. This amazing treehouse is a fabulous feature in the garden and is going to be appreciated for many years to come. The treehouse retails at £3499 including delivery and assembly. 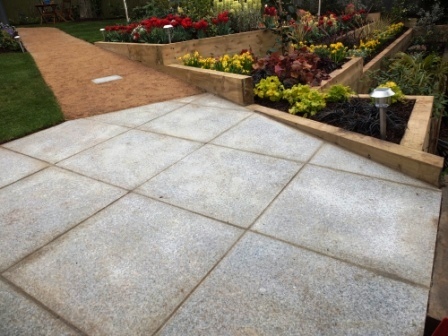 We chose silver grey natural granite paving to contrast with the golden Breedon gravel path. It is is hard to beat if you’re after a contemporary, stylish and minimalist design for your outdoor space. Its silver grey tone and textured surface make natural stone paving a striking surrounding for architectural-type planting. This was especially important to us as Malcolm loves that kind of planting, so it really helped to showcase it. It was the ideal surface for the top of the ramp in the garden as it was smooth, yet not slippery. The paving is available in two shades and three sizes. 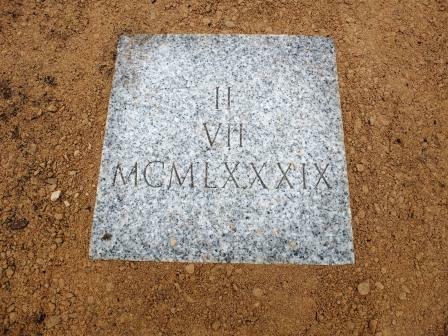 We selected the smallest size – 300 x 300mm to engrave three key dates in the Dean family’s life into the stone, which were then placed along the path. The paving is extremely hard wearing and resistant to staining, so is perfect for a garden like this where low maintenance is of prime importance. We chose these GRP (glass reinforced plastic) planters because they really fitted in with the contemporary design of the garden. We decided to paint the handrail a matching red colour to tie the two together. GRP is strong, watertight and light weight – ideal for pots because you can move them around easily. It won’t be damaged by frost and readily accepts different paint finishes. We selected the bright red contemporary planters, but they are available in a rainbow of colours, plus metal look ones. Virtually any shape, size or style can be accommodated using this material for planters. 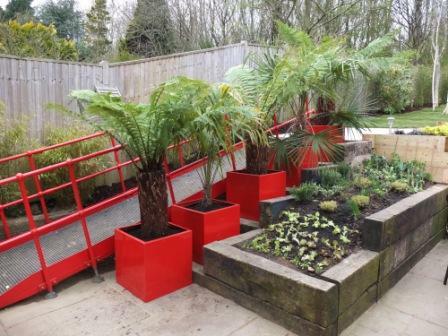 The bright red planters perfectly show off plants with a green foliage and so made the perfect for the tree ferns and fan palms. These planters are available in a range of sixes too – we selected ones which were 500 x 500 x 500mm, however, they are available in a huge range of sizes or bespoke. The red GRP 500 planters retail at £99.95 each. We chose to use sleepers for our terracing because they have a natural look and are faster to construct than bricks or concrete blocks. We also decided that they would look really stunning set vertically in the seating area further up the garden and cut them at varying heights to add interest. 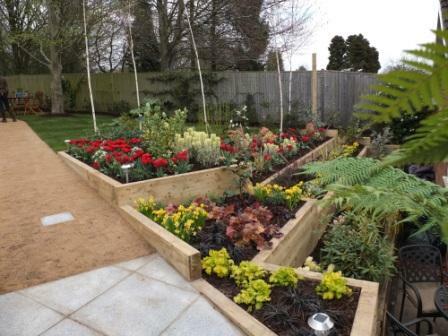 Railway sleepers are extremely versatile and suitable for a wide range of landscaping projects. New softwood railway sleepers can be used for many purposes and we selected them for their versatility. Because these new railway sleepers are not creosote treated like recycled railway sleepers, it means that they are suitable for use in many more landscaping projects and great for raised vegetable beds. There are a choice of other railway sleepers available: Hardwood second-hand railway sleepers have eye catching rustic looks and unbeatable ground contact durabilty, due to their cresoted treatment. These sleepers will last for many years, but are not suitable for use where growing produce due to the creosote within them. Rustic garden sleepers are made from new softwood, but are distressed and marked to give them an aged look similar to hardwood railway sleepers. Oak sleepers are hard and very durable, they last longer in the ground than softwood but they are more expensive to buy. We have a achieved a stylish look with the softwood sleepers, whilst also tying into the garden’s natural surroundings. Softwood sleepers retail from £10.32 each. We chose the Berkeley 110 Round set for the Deans to dine on outdoors because it is stylish and comfortable. It is ergonomically designed and is lightweight and strong. The cast aluminium garden furniture is virtually maintenance free and will not rust, yet looks like it is made from a much heavier metal. The beautiful woven lattice design of the table is very attractive. The dining set comes with 4 chairs which have with gently curving arms with luxury reversible cushions. The showerproof cushions are also easy to clean. It also has a 2.5m parasol with both a crank handle and tilt operation for easy use and comes with a sturdy 15kg base. 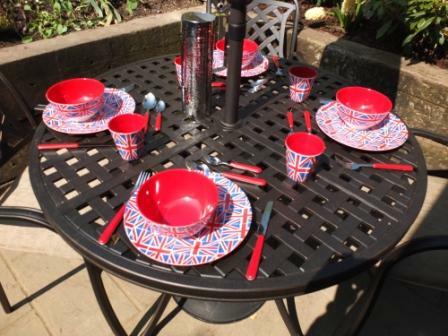 It is the perfect size for the lower seating area in the garden and Malcolm can join Trish, George and the rest of the family when they eat alfresco.